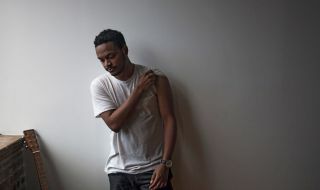 Lee Bannon wasn't born in New York but the Big Apple is the city he now calls home, and it played a starring role on his much- lauded debut album, Alternate/Endings, recently released on Ninja Tune. The 26-year-old producer constantly records New York's daily life, turning those clicks, bangs, burbles and sirens into music. "If you want to know what my most important instrument is at the moment, it would probably be my iPhone," he explains from his Brooklyn studio. "I didn't want my debut album to sound like everybody else, so I was constantly searching for my own sounds." Perhaps best-known for producing rapper Joey Bada$, this Californian producer has thrown a musical curveball with his solo debut, delivering a dozen tracks steeped in the fluid drum 'n' bass beats of UK scene legends like Goldie and Photek. "It would have been easy for me to kick out another stereotypical hip-hop album, but that didn't feel right. When it comes to making music, rule number one is: always be true to yourself. This is my true album." People are talking about the last 12 months as something of a jungle/DnB renaissance. Good timing for the album! "Yeah, but there are also a lot of people - people who really know drum 'n' bass - who will say, 'How can there be a renaissance if the music never went away?' It has always been there... It's been a constant for many years. I guess the one thing that's changed is that the soul has returned - the soul and the spirit. There was a period when the music seemed to get a little robotic and mechanical, but what you're hearing today is a lot more emotional, and I hope my album is part of that new trend." "Of course! But one of my main influences was also Rob Zombie's work on the Matrix soundtrack. And then there's Venetian Snares, of course. I listen to a lot of music. And I mean a lot! My life is sort of like a hermit: all I do is stay inside the studio listening to music or making music. When an album grabs my attention, it leaves a footprint on my mind, and that will find its way into the music that I make. "From a US perspective, I guess the development of the current drum 'n' bass sound goes back to the Californian beat scene in 2004/2005, then on to the early Flying Lotus albums. Everybody was trying to push the beats a little bit further, but with hip-hop all you can really do is slow them down or speed them up. As people got faster and more intricate, the sound started to morph into other genres. The BPMs pick up, and you're getting towards drum 'n' bass. Last year, the whole thing in the States kinda came full circle with Teklife and DJ Rashad... It's called 'footwork' out here, but it's essentially jungle arrangements with a 707/808 kick. "Like I said before, this is a sound that has never gone away." "Once I built my Alienware computer, I realised that this whole other world had opened up in front of me"
"Maybe ten or 11 years ago - I was probably in 8th grade - I got hold of a Korg Electribe. Man, I loved that thing. As a kid, I'd never bothered with a guitar or drums or anything like that; my idea of making music was definitely driven by electronics, computers, sequencers, and - ultimately - samplers. Once I built my Alienware computer - those things hold up pretty well and I still use it today! - and got hold of Cakewalk Project 5, I realised that this whole other world had opened up in front of me. "Whereas one guy might stay at home learning how to play this amazing guitar solo, I started to learn how you could control attack and decay... reverb and pitch. Everything that went into the computer suddenly became an instrument." Did you know how to create a track? Did you know how to write? "There were a couple of very big moments for me; moments that changed how I approached music. One was finding a clip that someone had uploaded of DJ Premier, and the other was a video of an interview with Squarepusher. Seeing him in his studio and seeing how he would just grab a bunch of sounds and turn them into a song altered everything for me. "And, from there, I think it was just... luck. Luck and meeting the right people. To me, music is a little bit like kung fu. Yeah, there are some basic rules, but as you meet and train with other people, you start to develop your own style. I was living in California at the time and there were some great sounds coming out of the Bay Area. In my senior year at high school, I happened to create a couple of beats that got picked up by an artist called Planet Asia. From that, I got to meet Del Tha Funkee Homosapien, Dilated Peoples and all those other Californian acts that were around at the time." And that, eventually, led to you producing Joey Bada$. "I got lucky, man... I got lucky." C'mon, it has to be more than that. "What I had going for me was that I had sat and listened to a lot of music. I knew what sounded good, and I knew how to make certain calls in the studio. I had focus and a desire to make things cohesive. If you ask me what production is about, I'd have to say it's about making things cohesive. Bringing all those elements together and turning them into something that excites people. "As I've gotten older, I've started to research some of the producers from the past; people like Phil Spector and Brian Wilson. I love to listen to music and then find out how that sound was created. Each day, I'm learning new techniques and new ideas and new references. I don't just want to be the 'this' kind of producer or 'that' kind of producer. I'd like to be able to apply myself to any kind of music. "In some ways, you could say it's about stepping away from the mixing desk. Instead of worrying about which buttons to press or which compressor to use, you have to start shaping things inside your head and your imagination. "Recently, I tried taking that even one step further; I tried to write an entire song in my head. I was on a flight coming back from LA, and I just started to put this thing together in my head. When I got home, I sat down and put those pieces together in the studio. It worked!" You mentioned that you're still using your old Alienware computer. Does that mean you're still using Project5, too? "Currently, yes, I am, but there is a whole story I have to tell you before we get to the current setup, because Alternate/Endings was made on a totally different setup. After Cakewalk, I worked with Sony Sound Forge and then got myself a Mac and moved on to Logic and Ableton [Live], which is when I started on the album. I enjoyed Logic a lot... I'm not big into plugins, and I found that the basic onboard synths were pretty good. "Ableton played a different role for me. I really love Simpler, being able to just throw random noises in there and create my own 'synths'. For instance, if I needed a pad sound, I could sample a 'whoosh' from a documentary on the ocean and put that through a ton of guitar pedals or D16 effects. Suddenly, I've got my own, individual pad sound. That music is mine - it has my footprint on it." So, why did you go back to Project5? "It's all about that idea of individuality. I'm running an old sequencer on a Windows XP computer; it's a primitive setup that not many people have access to, and it gives my music a certain swing that I can't find anywhere else. I'm also using a hardware sampler, the [Roland] SP-555. All the drums go through there, just to give them some extra crunch and grit." It's almost as if you're going back to the DnB old-school - a sequencer and a sampler. "If you listen to early Goldie, he was getting a great sound from a sampler, and I'm trying to get closer to what I would consider a great sound. Some people may say, 'Doesn't digital technology help when it comes to creating loops?' But digital technology can only do so much. "Creating drum 'n' bass was a time-consuming job with hardware, and it was a time-consuming job when I was working on Ableton and Logic during the Alternate/Endings sessions. If you want to get a loop that has your own character - especially a jungle/drum 'n' bass loop - you still have to hand-craft every roll, fill, accent and filter." Where do your drum sounds come from? "I've been collecting drum samples for as long as I've been making music. I've got entire hard drives full of drum sounds that I haven't even investigated yet! What happens is that you settle into a particular area of drum sounds that work for you. Sometimes I stack them, and sometimes I prefer the minimal approach of just one kick drum and one snare." "My field recordings can get turned into anything, but there are a few clicks and pops that have made amazing percussion sounds"
"They aren't just for drums. My field recordings can get turned into anything, but there are a few clicks and pops that have made amazing percussion sounds. I love the idea of constructing music from life." "It's interesting to hear you say that, because I never felt there was enough space on the album. I used the stock Ableton reverbs and I was always looking for more - always trying to get the reverbs to sound wetter. "I recently got myself a hardware spring reverb, and what I'm hearing from that is completely unmatched by anything in the digital world. The sustain and the warmth and shine is just into a whole other realm." You made your name as a producer of other people's music. Does that mean you consider songwriting and production as two very distinct tasks? "Yes and no. Sure, there is a lot of post-production... a lot of playing around with effects after the song has been written. That's how you get a song to breathe. [iZotope] Ozone will be used throughout most projects, with a light dose added over the mix right at the end. I like to make things loud, but I still want them to sound real. I don't want artificial loudness. "The SP-555 has got some insane effects, and I'm hoping to get hold of a Sherman Filterbank. I also have a friend in Brooklyn who builds me a lot of custom hardware boxes; maybe a filter or an oscillator. I have guitar pedals, too. I don't want to give away all my secrets, but the Ibanez ES2 Echo Shifter gets a lot of use." It sometimes sounds like you're slightly suspicious of plugins and digital technology. "Not at all! From a drumstick to my iMac, everything is out there to be used. I've got all the Native Instruments synths and use Absynth sounds quite a bit, but I don't like the idea of having to rely on them. I'll happily make music with any device or tool I can lay my hands on. "If you just use presets and patterns then your music won't stand out. That's where art comes in"
"There is definitely an argument that says it's a lot easier to make music than it used to be. Digital technology has made it possible for anyone to pick up a computer and a bunch of presets and make a song. You've only got to listen to a lot of the electronic music you find in the charts. I don't want to take anything away from that, because there is nothing at all wrong with it. But it's all about presets and patterns. If you just use those presets and patterns - and nothing more - then your music won't stand out. "That's where art comes in. That's where you have to go beyond the basic level and tap into the real ideas and inspiration behind what you want to say. If you can do that, and if you can get to that place, your music will make its own mark." Lee Bannon's new album, Alternate/Endings, is available now online and in shops.